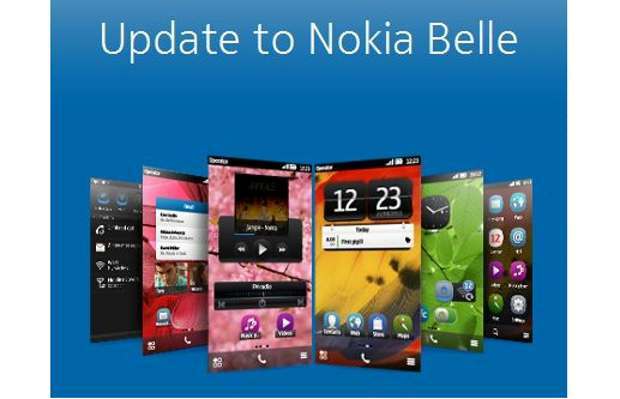 Symbian Belle - sorry, 'Nokia Belle', Feature Pack 2 has been available now for a few weeks and it's time to take stock. How many steps forward did this take the OS? And how many steps back? What's in Belle FP2 and how does it compare to other smartphone user interfaces in 2012? Not every feature mentioned in this feature is available on every smartphone. I'm using the Nokia 808, but much will also be relevant to the Nokia 701, 700 and 603. It's worth noting where Belle FP2 fits into the Symbian timeline. OK, yes, at the very end, but it's instructive to look back and gather some historical perspective. It's often quoted that Belle FP1 is the same as what was once called Symbian 'Carla' and that FP2 is what was once called 'Donna', but this is simplifying things way too much - when those projects were first proposed within Symbian and Nokia, their contents were different to what emerged as updates in the real world. Which is to be expected. So I'll stick to the published OS update names here. S60 3rd Edition (including FP1, FP2) - the vast range of non-touch, pre-2009 (mainly) QVGA smartphones - I won't got into detail here, but there's 100,000 words of content about these devices and their software scattered here around AAS. Hero devices: Nokia N95, Nokia E71, Nokia N86, Nokia E90. S60 5th Edition (December 2008) - Nokia's first cut at adapting S60 to a full-face touchscreen interface. The transformation worked but was inelegant in terms of an optimised UI. Most generic S60 3rd Edition applications could be used or adapted easily. A step forwards but an ugly one and the use of resistive screens on most of the devices was clumsy in a world getting used to a popular Apple iPhone. Hero devices: Nokia 5800, Nokia X6, Samsung i8910 HD, Nokia N97 mini. Symbian^3 (September 2010) - came out on the next generation of Nokia hardware, including full graphics acceleration, making possible really decent games and effects. There were some optimisations for touch over S60 5th Edition, plus two extra homescreens, and automatic text correction in the built-in landscape QWERTY virtual keyboard. Hero devices: Nokia N8, Nokia C7. Symbian Anna (August 2011) - came out on the Nokia E6 and X7, plus a huge update for existing Symbian^3 generation devices, bringing portrait mode QWERTY, split-screen entry, a much better Web browser and interface, whole new icon set, smooth homescreen swiping, big updates to Photos, Camera, Mail, Social, and more, NFC activated on the Nokia C7. Hero device: Nokia E6. Belle (October 2011) - came out on the Nokia 700, 603 and 701, plus a huge update for existing Symbian^3 generation devices, bringing a major reworking of the user interface, with an emphasis on ease of use and flatter navigation hierarchy, a new RAM management scheme, full NFC 'tap to ...' functionality (where supported by the hardware), variable-sized widgets, up to six homescreens, a drop-down notifications and settings pane, a 'flat' application launcher by default, big facelifts for Camera and Music player. Hero device: Nokia 701. Belle FP1 (April 2012) - came out on the Nokia 808 PureView, plus an update for the Nokia 700, 603 and 701, bringing an increase in the clock speed of the Nokia 701 and 700 from 1GHz to 1.3GHz, a raft of new homescreen widgets and toggles, the introduction of Dolby Headphone and Dolby Digital Plus functionality where appropriate. Hero device: (obviously!) Nokia 808 PureView. 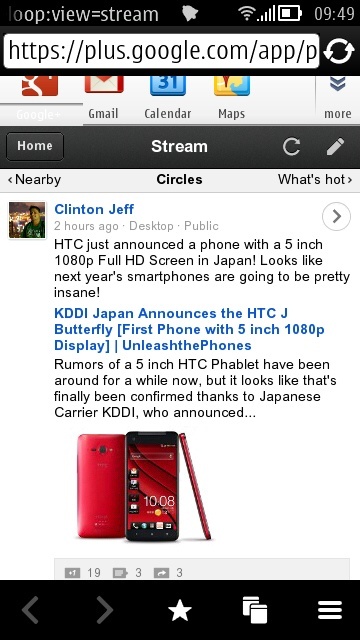 Belle Refresh (August 2012) - an update for much of the Symbian^3/Anna/Belle generation, though rollout is still patchy. 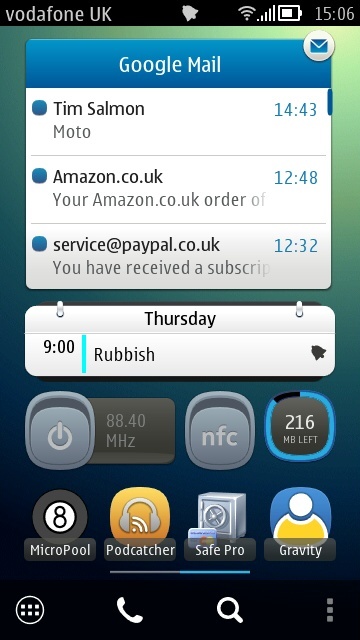 Brings many widgets, application updates and optimisations. Belle FP2 (October 2012) - an update for the Nokia 700/701/808 generation, still rolling out as this article is written and covered in detail below, bringing many application updates, multi-touch in the virtual qwerty keyboards, cosmetic changes, music player control from the notification bar, more widgets, and additional functionality for the Nokia 808. It's instructive to take stock of the state of Symbian as we finish 2012, in the light of the rest of the smartphone industry. Once upon a time (2006), Symbian was the smartphone world, with market share frequently quoted around 60% or more. Since then we've had the Apple iPhone (2007), with iOS gradually improving year on year, plus Android (2008), improving just as fast, and Windows Phone (2010), currently in the middle of a big step change up to Windows Phone 8. What all of these mobile OS have in common is that they're designed from the ground up for full-face touchscreen devices and that there's an emphasis on a slick user experience. Symbian came from a world where the main thing was providing functionality - this was a world where almost every function was new and remarkable (camera, navigation, stereo music, web browsing, and much more) and Nokia in particular was a company that was engineering-focussed, so speed of interface and whizzy effects were nearly always sidelined in favour of (for example) better battery life. In contrast, modern 2012 devices are assumed to be plugged into a charger every single day, screens can be enormous and processor speeds and interface software can be allowed to run at insane speeds. The approaches are very different and it's not surprising that Symbian and Nokia struggled to make the switch to be in line with 2012 smartphone expectations. 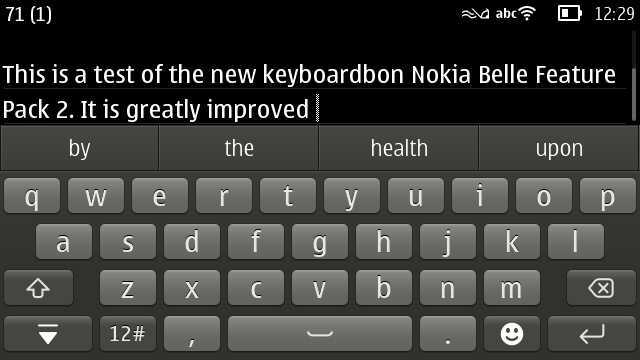 The very fact that it's taken over four years for Symbian's virtual keyboard to support multitouch (i.e. you can press one virtual key before another finger has lifted from the previous one) is testament to how hard changing some of the deep-seated components in the OS has been. Even now, we've got something of a patchwork quilt of a smartphone OS. 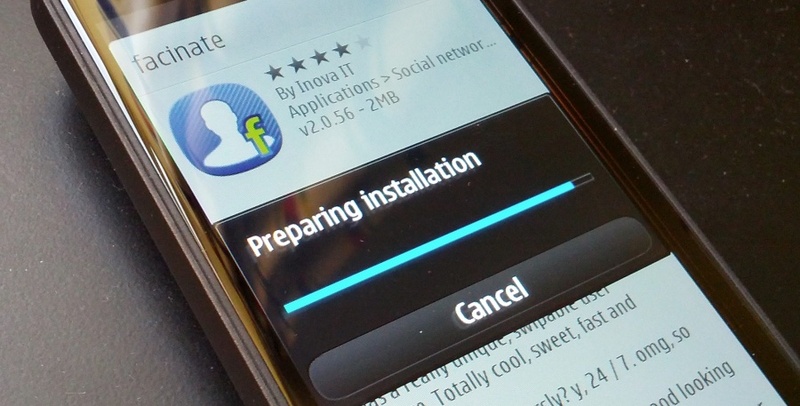 Astute observers of the comments threads on all our update stories here on AAS (some of which are linked above) will notice that there are always a few gotchas, a few steps backwards to accompany each brace of steps forward with Symbian. It's something we've come to expect, not least because every change (in the name of modernisation) is bound to annoy people who were happy with the previous version. It's even a valid question to ask whether in fact Belle FP2 is the best version of Symbian OS yet - I know a fair few Nokia E6 owners who were much happer with the more d-pad focussed Symbian Anna and who were mightily upset by the switch to Belle. 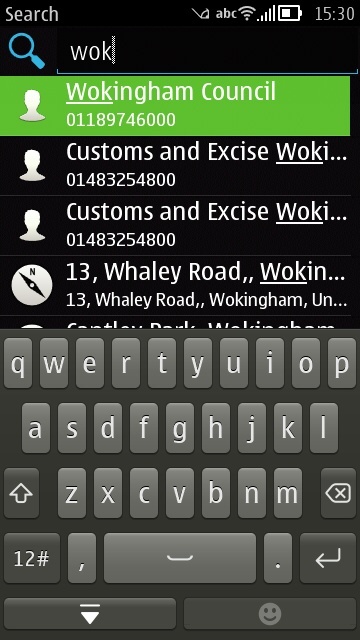 Or the Nokia 701 owners who found the rewritten Photos application (put in place because of the 808's needs) annoyingly cut down from the version in Belle FP1. But, despite a few minor upsets along the way, simply having the latest versions of Web and Email and the video codecs, and so on, having the smoothest performance, having the sleekest camera UI, are all worth having and I'd always recommend that people upgrade to the latest version of firmware offered - for every one annoyance there will be two more things which either delight or work better under the hood. In short, Belle FP2 is well worth having and in the sections below, I explore what's new, what's good and, in some cases, what's frustrating. Add it all up and Belle FP2 is a pretty significant update - in the case of the Nokia 808 PureView, it transforms it from an awkward camera-centric phone ("What, no multitouch input? What, no way to mass delete images and videos?") 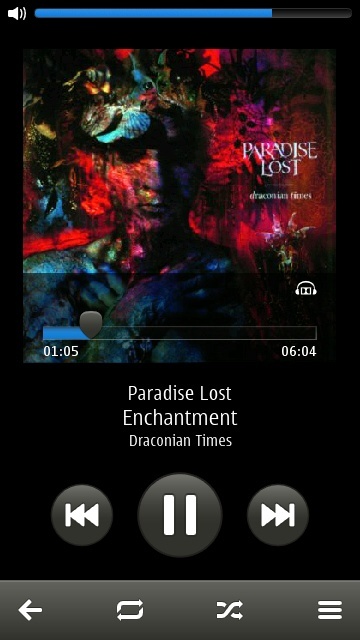 into a much more useable 2012 smartphone. Critics of Symbian will still maintain that the OS isn't useable, but I suspect that such writers are still thinking of their old N8 with launch firmware or (shudder) their experiences with S60 5th Edition on the Nokia 5800 and N97. Much as I loved the latter two devices as a Symbian geek, I can see how the resistive screen, scroll and select UI paradigm, and scarcity of system disk space and RAM would all appear pretty unusable to someone used to an iPhone or Android phone in 2012. Which is very unfair, since Symbian (as detailed above) OS and its user interface have gone through at least four major versions since the days of the 5800/N97. Slamming Belle FP2 on the Nokia 808 (or 701) is a bit like me comparing the 808 to an original iPhone and complaining that it had no support for applications. 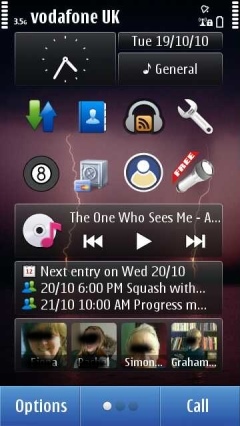 With the extra batch of widgets added for Belle FP1 and FP2, Symbian now has, built-in, just as many homescreen gadgets as most Android phones. From clocks to weather to connectivity toggles to a data counter to application shortcuts to email and calendar views to music playback, Belle FP2 now has pretty much most use cases covered here. There aren't a huge number of third party widgets (maybe less than fifty in total), but I for one am very happy with the current selection. From left to right, anti-clockwise: Email inbox (swipeable/scrollable), calendar (next event, though there's a bigger one available showing a full agenda, if desired), FM transmitter on/off (still a killer feature on the 808), NFC on/off (I don't use it that often, so why leave the NFC antenna powered up? ), four application shortcuts (my most used apps), four of the major Symbian applications, for easy access, current weather and for the upcoming two days (a five day forecast is available if I tap through), shortcuts to my other two family members (i.e. tap to call or message or email them), plus shortcuts to the HTML5 Google+ interface and BBC iPlayer (for streaming programmes or downloading them to mass memory). 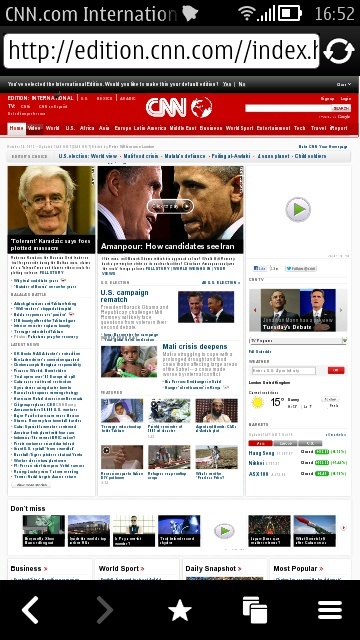 Note the bottom toolbar - I'm using the Belly Jean theme, by the way, which I highly recommend. Belle FP2 adds a permanent search icon, tap this to be able to type anything and have it quick matched in all contacts, calendar items, web bookmarks and history, plus the single tap option to search for what you've typed so far in Google or Bing. Sound revolutionary? 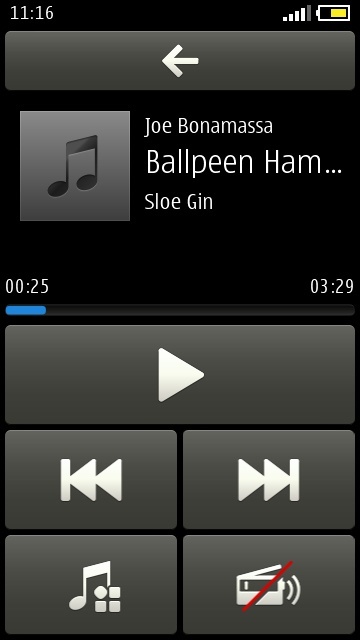 Not really, Palm OS had this back in 2000 and Apple most definitely did not invent the idea, whatever its lawyers say. Quickmatching a contact and a web bookmark - two of the many uses for the integrated Search facility. 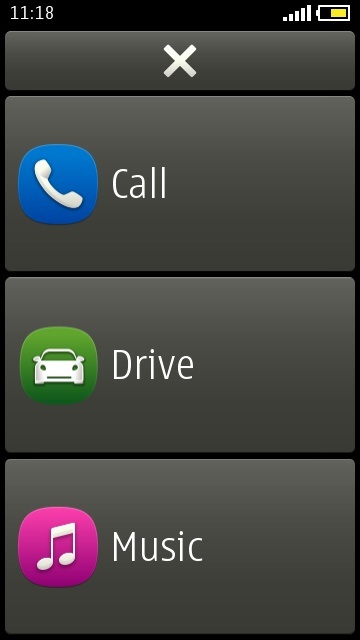 The main application menu has been 'flat' since Belle arrived (see above), but this ease of access for new users (i.e. nothing is hidden) is a pain for experienced users (like me) - I create folders for 'Video-related' applications, for 'Games' and for 'Rarely-used' applications. Putting icons into these folders is as easy as long pressing one and choosing 'Move to folder'. The system works very well, I end up with about three screens of icons to scroll up and down, at most. One of the most significant changes for Belle FP2 was the addition of a 'staggered' layout qwerty keyboard with multitouch. The old 'grid' keyboards are still there in the OS and brought up by some legacy applications, as indeed is the old 'numeric keypad' method of entry. As indeed is a brand new, rewritten numeric keypad. Gah - I said things were a little confusing under the hood in places! The new layout is similar to those on most other 2012 smartphones, so will be welcomed by users and critics alike, while the multitouch handling means that you can, in theory, go a lot faster when typing, not having to lift each fingertip cleanly before placing the next one. The aforementioned step backwards is because there's now no option (at least in the current firmware build) to auto-insert word corrections. So you can't hammer away, iPhone-style, and trust the software to kick in - instead you have to keep a close eye on what you're typing and, when a word goes wrong, you have to tap the appropriate correction from the suggestions listed above the virtual keys. In practice, this slows down input to more or less what it was without multitouch - maybe slower. Such an omission can be argued to be a deliberate design decision ("People hate having their words corrected to something they didn't mean"), but in my view the vast majority of users will want (and expect) auto-correction, just as on iOS, Android and Windows Phone. A major disappointment, though surely something that can be easily fixed by Nokia in a software update/patch, if there's still the will and resources at Accenture. Of note is that the most commonly used punctuation symbols are now not only on the underlying symbol keyboard, they're also mounted as a quick-tap panel of eight that pops up when you long press comma (,) or period (. 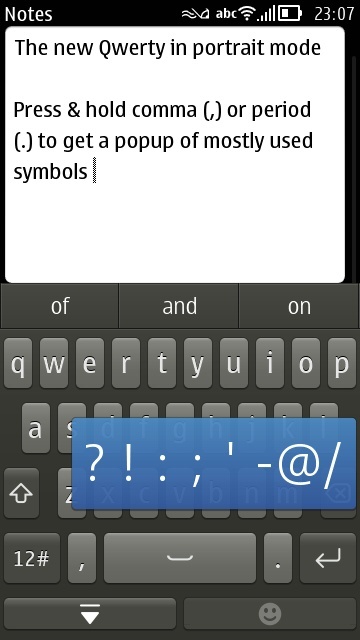 ), in much the same way as long pressing a letter pops up a panel of accented character options has always done on Symbian's QWERTY implementation. Tap in editable text to position the cursor - once the cursor is placed (approximately), 'nudge' arrow keys (in blue and hard to screenshot here!) appear for a second or two, to allow more accurate placement if needed. 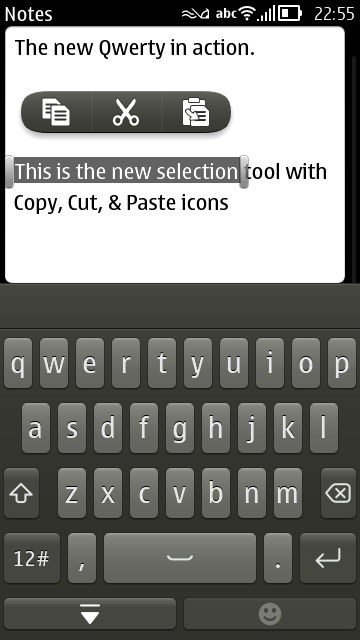 Tap and drag to select text, which appears highlighted, along with start/end markers. Drag the end markers as needed, to further refine the selection - a magnifying glass helps here, by showing more closely exactly where the markers are going. The system works well and is fully-optimised for touch. The system's unashamedly text-based though and any observer would have to give iOS's rich clipboard system the edge in this regard. Still, it's ample for what most of us need and very slickly done. I can be accused here of being a little old-fashioned, but I rarely 'browse' web pages on my smartphone. If a link is passed to me via email or Twitter then I might choose to open it in Web and have a read, but 95% of online information comes to my Belle FP2 phone via clients: email, social, timetable, reference, and so on. This was with the default Android browser - apparently Chrome's even faster. The Galaxy certainly isn't the fastest of the current 2012 smartphones, but is up in the top bracket and makes for a good litmus test for whether Web in Belle FP2 on the 808 can pass muster. 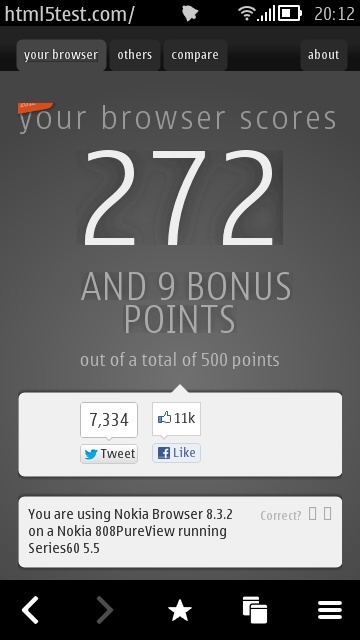 The results won't surprise anyone who's tried loading pages in Symbian Web in the last few years. Although the amount of HTML5 compatibility has risen massively (as shown below, and which is why you can use, for example, the Google+ site), the overall speed of rendering hasn't. Add this to the relatively low nHD screen resolution and it has to be said that you have to be something of a masochist to do a lot of web browsing on Symbian, even at Belle FP2. One new extra for Belle FP2 is being able to directly save a Web bookmark to an 'application'. So, in the case of the HTML5 Google+ site mentioned above, the user would just long press on a part of the page desired and on the pop-up menu is a new option 'Install as application'. This is more or less instant and the favicon for that page is then shown as a bona fide application in the main menu (in similar manner to how the iPhone manages putting Safari bookmarks into its app menus). Quite cool and I suspect many of us will get some use from this convenience feature. 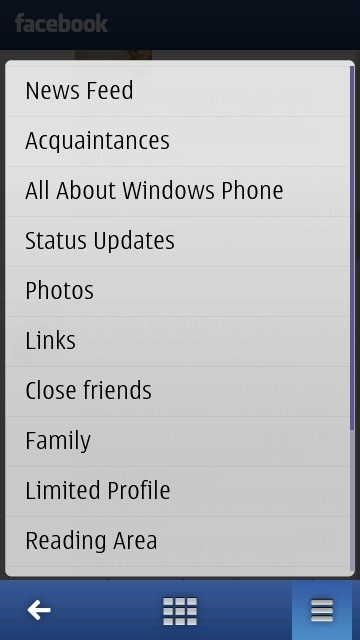 In theory, social integration into Symbian these days is excellent. Belle FP2 comes, as detailed above, with another new version of Nokia Social, with extra optimisations and wizards to sync contact thumbnails from social networks to matching contacts in your main address book on the phone. There's a traditional tabbed Twitter view, full support for uploading media, homescreen widgets, plus a rather comprehensive Facebook client with all the features a casual user might need. And it's all in the phone, for free - what's not to love? 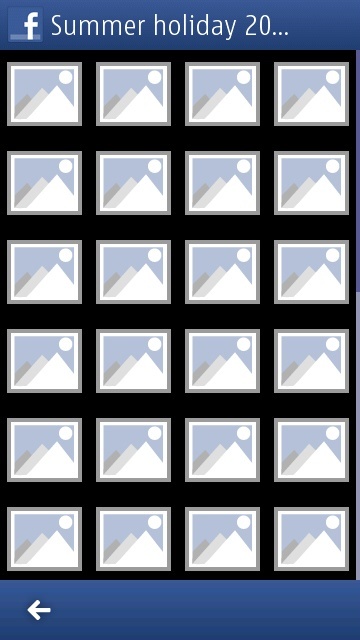 Diving into a photo album in a friend's profile is a frustrating experience - the gallery of blank thumbnails (left) persisted for a good 30 seconds before anything happened; right, the standard Facebook newsfeed view. 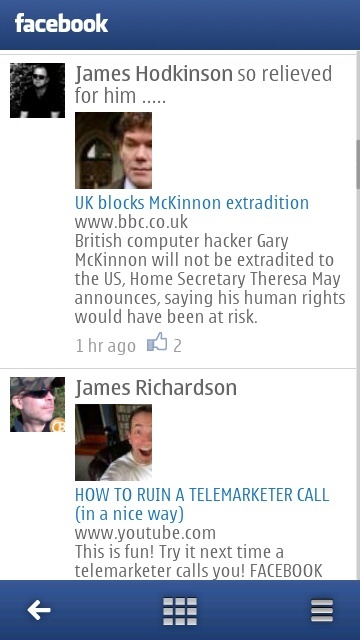 Talking of 'pale', another longstanding gripe of mine about Nokia Social is that it steadfastly continues to adopt a white theme for the entire interface - on the AMOLED-screened Nokia 700 and 808, this is a huge power-hungry no-no. 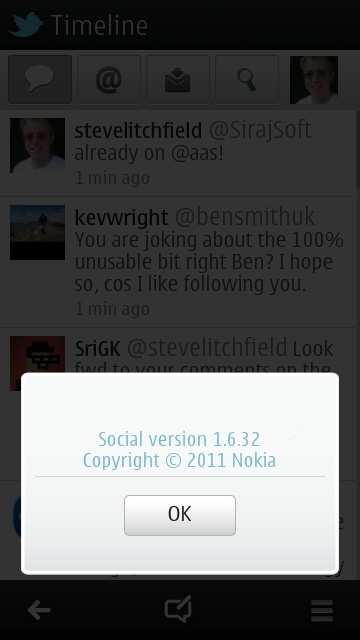 Every other social client on Symbian seems to be able to put a 'dark theme' in its settings, so why not Nokia Social. 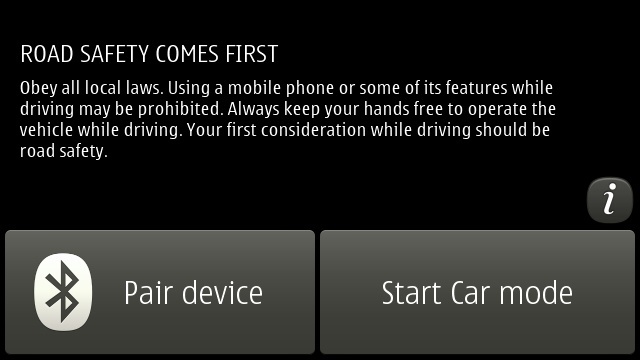 It'll be fine, colour-wise, on the TFT-screened Nokia 701, but this is another reason I can't recommend it on the flagship Nokia 808 PureView. As you can see from the screenshots, all functions are implemented with over-size buttons, making them easier to hit without taking your eyes off the road for too long. Very cool, and every smartphone should have something like this. Also in Belle FP2 is a new Camera application - new, that is, to the Nokia 603, 700 and 701, since it's the guts of the Camera application that debuted with the Nokia 808 PureView. On the plus side, the interface is now more intuitive and you can launch the camera from a locked phone by pressing and holding the shutter button - on the minus side, there's no option in the new app to switch to the front camera - yet another example of the two steps forwards, one step back syndrome that has plagued Symbian in recent times. 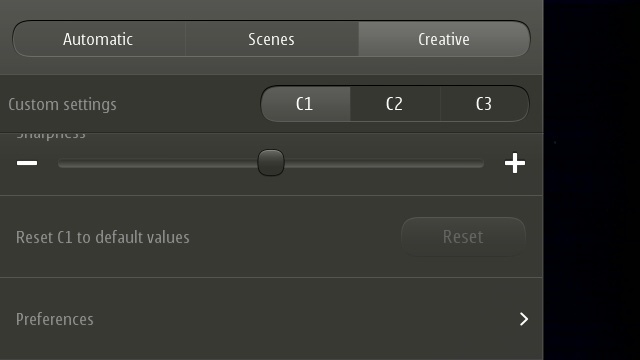 On the 808 PureView, down at the bottom of the Creative pane of settings, there's the extremely welcome option to reset any of the three custom presets to 'default values'. I was forever fiddling with something and forgetting to change it back, so this gets a big thumbs up from me. 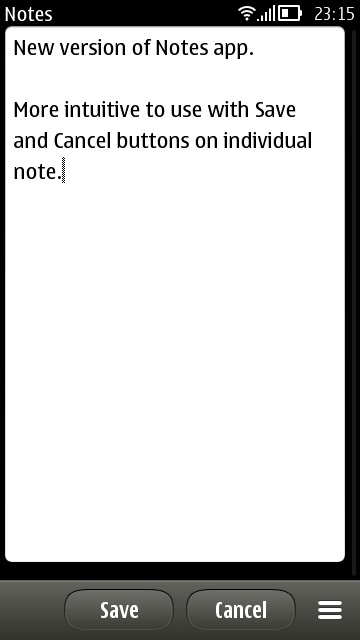 In addition, Notes has a new UI with more obvious means of saving a new entry. And Photos has been totally rewritten for blistering performance - ostensibly to make rendering the Nokia 808 PureView's (potential) 38MP images possible, but the speed increase will be noticeable on other phones too. 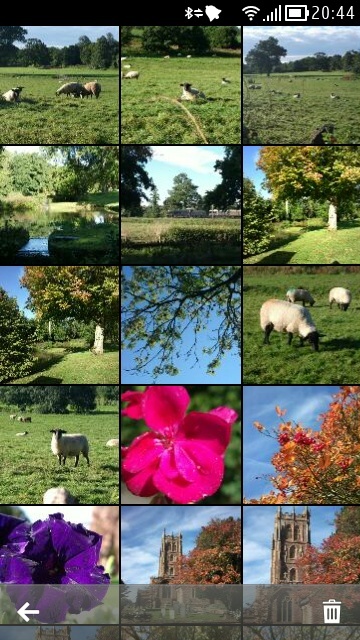 The downside is that the only multi-tag option from the main gallery is 'Delete'. Other operations (e.g. 'Send') have to be done on each image individually. Overall, I'm happy though. 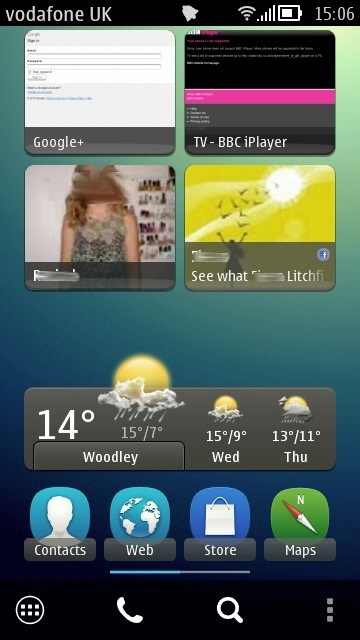 Belle Feature Pack 2 is likely to be the very last major update to Symbian OS and it's a bit of a 'curate's egg' if I'm honest. I'm glad it's out, there are plenty of splendid features, but there are weak points to the whole OS that remain weak and there are silly bits missing (e.g. 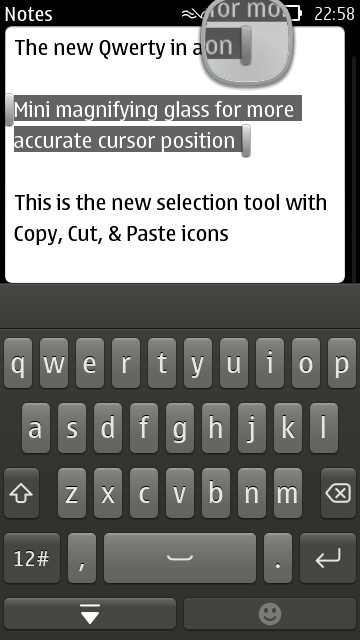 auto-correct in the keyboard) that really need patching via Sw_update sooner rather than later. With the UI out of the way, your buying choice then comes down to whether you value Nokia's rather terrific hardware and gadgets over the admittedly limp state of its application ecosystem.